“Prayers and Struggles” from Christian Faith Publishing author Dawn Counts is a guide on prayer and how vital it is toward being a Christian. 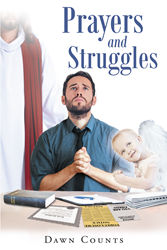 “Prayers and Struggles”: helps explain the scripture behind prayer and how the author has used prayer in life. “Prayers and Struggles” is the creation of published author, Dawn Counts, a mother whose faith has been tested several times and overcame several struggles in life. Published by Christian Faith Publishing, Dawn Counts’s new book aims to explain some of the workings behind prayer and how vital this habit is toward being a Christian. Counts explains the personal struggles of distraction and procrastination that the author had to conquer before devolving positive prayer habits. Dawn Counts speaks to readers as a Christian who has personally struggled with faith on occasion, but whose faith has overcome each doubt in time. Using prayer as a base for positive action the author used in life. View a synopsis of “Prayers and Struggles” on YouTube. Consumers can purchase “Prayers and Struggles” at traditional brick & mortar bookstores, or online at Amazon.com, Apple iTunes store, Kobo or Barnes and Noble. For additional information or inquiries about “Prayers and Struggles”, contact the Christian Faith Publishing media department at 866-554-0919.